What’s that? It’s Retrochallenge time again? I'm sure pretty much everyone in the retrocomputing world would agree when I say that nostalgia is a major driving force in the hobby. Everyone has their own stories about the systems in their collection: maybe it was their first computer, maybe it was the system they had at school, maybe it's something they drooled over at the time but weren't able to get. For Retrochallenge 2017/04, I thought it would be good to have a trip back to revisit one of the systems I regretted selling when I was a teenager and subsequent adventures with a replacement. Back in 1994, I went with my dad to a computer auction in my home town. Dad had seen a 486 DX2/66 tower with decent specs which he thought would be a nice upgrade for his business system (at the time, a 386DX/33). I thoroughly enjoyed poling around the auction room, looking at all the different systems and bits of hardware that were for sale, including a little laptop with very little information - no manufacturer's logo, name, etc anywhere on it. 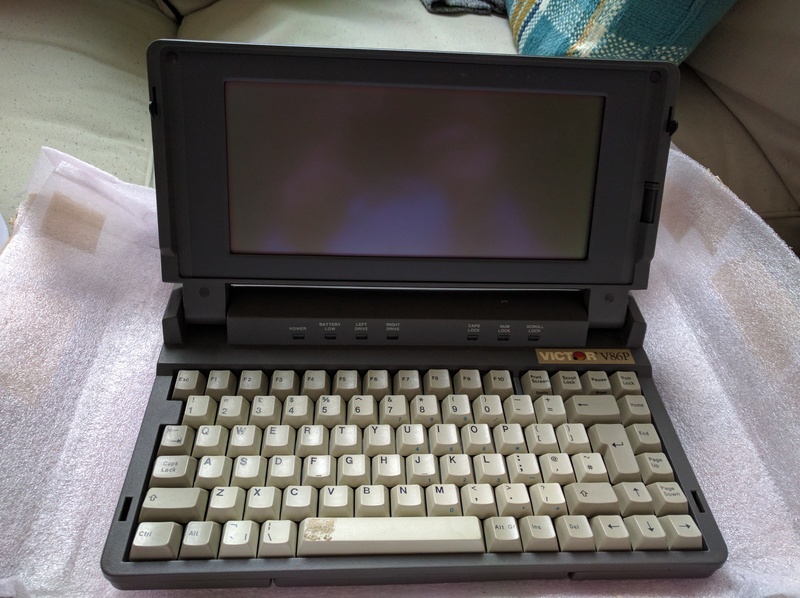 Dad clearly took note of this, because after winning the auction for the neatly spec'ed 486 (8M ECC RAM, IDE and dual-channel SCSI onboard, QIC tape, etc) he then went on to bid on (and win) this little laptop as something for me. I don't remember how much it was exactly, but I think it was in the region of £25. When I got it home and plugged it in, I discovered it was an XT-compatible system with a 10MHz 80C86 CPU, 1MB RAM, a monochrome CGA LCD (no backlight), dual 720k floppies, and a NiCd battery pack made of sub-C cells. The PSU worked, and the battery would take a charge, although the pack was clearly aging and didn't hold much of a charge. I used that laptop, along with WordStar, QBASIC, and ProComm+ for a couple of years before the mono CGA display with no backlight finally got the best of me and I saved up enough money to buy a used Compaq SLT/286. I sold my little XT laptop, and never saw anything quite like it again. At least, until late last year when I was telling another friend of mine in the retrocomputing community about it, and he inspired me to start looking. After quite a bit of digging, we identified the system as a Victor V86P and started poking at the usual auction and sales listing sites. Back in February, my friend managed to find one of these systems - missing its PSU and totally untested. He was able to pick it up for a decent price and happily boxed it up and shipped it over to me, and here's where the fun begins. There's not a lot of information out there about the V86P - although based on a few forum posts I came across, there's at least another couple out there in the hands of other collectors. For Retrochallenge, I thought I'd try and document as much about this sytem as possible and get it up online so other people who come across these sytems in future have a but more information to go on. Back to my new addition - it's not the exact same model as I had back in the mid-90s. This one is the higher-tier model, with a 20MB hard disk instead of the left-hand floppy drive. This means there's a little daughterboard on top of the motherboard, with a 26-pin cable running down to the hard disk underneath (more on this later). Intrestingly, it seems Victor didn't bother to make a second mold for the bottom part of the case, as the hard disk model still has the cutouts in the side for the floppy drive (and other pictures on-line show the same arragement). The lack of a PSU made things a little difficult, as it takes 8.5V on a 6-pin connector. Back in the 90s, I'd tried to find out more about this, and come up blank - in fact when I'd talked to my Grandpa about powering it for longer periods in the car, we came up with a simple linear regulator box that would take 12V from the car cigarette lighter socket, and output 6V on the battery input (we knew the pinout and voltage there), and get rather warm in the process. With the growth of such information on the Internet, we can do a bit better than that now. The nice folks over at siriusact1.co.uk have a PDF with the PSU pinout, but I also ran across this post which indicates pin 1 isn't Gnd. A couple of quick continuity checks confirmed that, but all this is really better suited for a later post. To cut a long story short (and I promise I'll put it on another post) - I have a mostly working Victor V86P with what seems to be a failing DC-DC converter, so it will boot, but only with drive powered by an separate supply to the motherboard. Gather and document as much information on the JVC 26-pin disk interface as possible - there's not much about this interface out there, other than it may well be a typical RLL interface with a few extra signals - there's a pinout here. To this end, I have a cheap USB TTL logic analyser on order, and a breakout PCB being manufactured. I look forwards to hearing more about this, especially info relating to you launching the “V86P Wiki”!